Don’t knock on the wrong door: CharterClick! Does the law matter for transnational solidarity? The linguistic future of the EU: a political choice? "Laboratory on migration in the EU"
The principle of European solidarity, which was originally conceived as one of the founding values of the European Union and as a motor for social cohesion, is currently being redefined. European solidarity has become one of the most contested claims in public debates turning it into a mobilization force for intellectuals, political actors and citizens’ movements. Through the analysis of such solidarity contestation in times of crises, we argue that a new politics of differentiated solidarity in the EU can be distinguished, which is different from the old politics of European identity. In line with and as a consequence of the intensified argument in favour of differentiated integration, differentiated solidarity entails a shift of emphasis from the promotion of European integration aiming to establish a reciprocal relationship among equals to the promotion of flexible arrangements among EU members, discretionary redistributive mechanisms and hegemony. 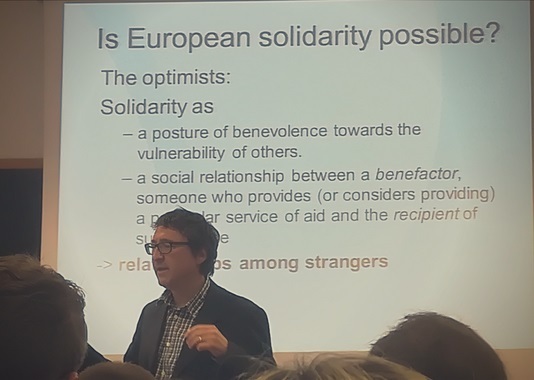 More specifically, during the Eurocrisis years, the following three mutations in the concept of EU solidarity can be observed: a) the exceptionality of charity: solidarity as acts of benevolence towards thirds; b) the exclusivity of egalitarian solidarity: national solidarity communities becoming more exclusive; 3) solidarity among non-equals: constant renegotiation of the costs and benefits of solidarity as a rescuing mechanism, which binds donating and receiving countries together in a situation of emergency.